As you are reading this you will probably be wishing to extract a fault code or clear a fault indicator lamp from the dashboard of your older Mercedes Benz model vehicle. You will have also likely been frustrated by reading a multitude of confusing information, following dead web-links and generally reading several different takes on the same subject – mostly from well-meaning members on forums or online motor clubs who unintentionally ‘muddy’ obtaining the most correct and technically accurate information. Well the alternative information source you have been looking for is here, hopefully clear and accurate enough for your needs. I have collected the following information together in one place to save the frustration of trying to locate and find most that you would ever need to tackle this job. I will not repeat what has already been expertly written on this subject, you can find links below to these sources to expand on what I have noted here. What I have done is written about the important parts and included some vital pieces of information that you may need to refer to – you may find this data at the other linked sources too, but at least it will remain available in another Mercedes resource should any of it disappear from the web, as a great deal on this subject already has. Enjoy! Back in the day when Mercedes first ventured into the world of on board diagnostics in the era of the 1984’s W124 and its stable mates they began to introduce electronic code diagnostics. The first being either through an 8 pin (X92) or 16 pin (X11/4) square block fastened to the bulkhead. There were actually only14 diagnostic pins on some 16 pin X11/4 models as slot 2 was a small momentary push button and slot 4 was a small red LED used to read out fault codes flashes. All was needed was a paperclip or short banana plug jumper to ground the required pins and simply watch the number of flashes. Codes are resolved from comparison of flashes to fault codes on a written list. 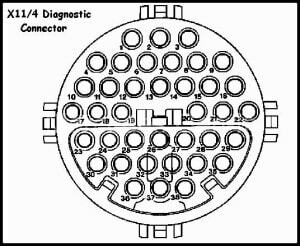 Counting flashes activated by grounding individual pins continued through the square block connectors to the 38 pin round X11/14 diagnostic socket to about 1994. This was commonly located within the ECU box and was accesses by removing a sealed access cap. Although 38 pins were used only the pins relating to build options were loaded and as such gave diagnostic flash / blink access to the cars individual modules. USA and some EU versions around 1994 were equipped with both a 38 pin X11/14 and the now common 16 pin oblong OBD port we use today. The reason behind this was that MB at the time had to comply with export requirements that necessitated access to emission data through OBD standard protocols. At this time Mercedes added the OBD port under the dash, in some cases near the steering column just to give access to emission related diagnostic codes, all the other electronic systems were dealt with through the 38 pin socket as before. So very much a hybrid situation was in existence – seemingly done as a quick fix to continue to sell cars in the US. So given the above history there are three primary diagnostic code reading methods (actually four) that you may come across in the model year window of 1984-1999 (Please note all dates stated are approximate and for guidance only) What is a little confusing is that Mercedes in their wisdom used the 38 pin diagnostic connector for both the analogue and digital systems making it very difficult to visually identify what system you are dealing with – they even used the same pin number allocations to reflect the connection to individual system components ! Useful links that have great information and should be used for reference. Here is some important information that budding MB SL R129 / W124 diagnosticians will need. 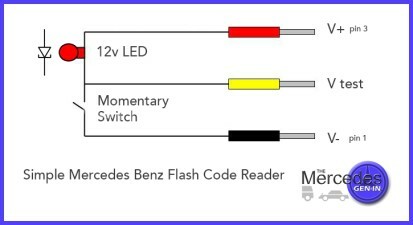 To build and use a simple Mercedes Flash / Blink decoder, here is the circuit diagram. 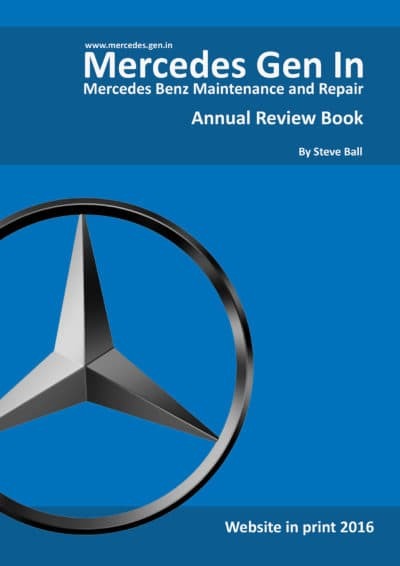 Here is the link to the Cs1000 Baum Tools Manual code reader that contains most of the detailed information you may ever need regarding, connections, pin outs etc specifically for Mercedes Benz models. Importantly it contains the analogue flash / blink error code fault decoder information. 1.Connect the code reader cables to pin 1 for the black or ground connection and pin 3 for the 12v supply on the 38 pin diagnostic socket. Select your chosen test point (module connection) to test from the following 38 pin socket diagram and connection pin-out table. 2.Turn ignition on, engine not running. 3.Press momentary switch for 2-4 seconds, wait and then count flashes. Note down the number of flashes on a piece of paper. Repeat the process until the first flashed code repeats. 1.After reading a code, press the momentary switch for 6-8 seconds then release. 2.repeat this for all stored codes. Mercedes SL R129 38pin Diagnostic connector pin out diagram and function list. Please note not all pins are loaded in every model, the quantity of available pins depends on model, version and fitted equipment. I have discovered that this period model (The one I have!) was fitted with a combination of both analogue (Blink / Flash) and Digital Mercedes Proprietary diagnostic systems. I do not have an OVP module (voltage controller) I have a Base Module. The base module can be accessed with the blink/flash code reader, faults read and cleared on pin 8, while other system components can be accessed with the Mercedes Proprietary reader from the same socket! However that is about the extent of any function accessible by this method. As stated earlier above to read engine codes or ABS codes etc the unit has to be connected to a capable electronic code reader. The Autel OBD2 reader I use for most of my modern day Mercedes diagnostics does not work – even with the OBD 16 pin to 38 pin adapter. This is because the protocol or access language is specific to Mercedes. About the only system capable of reading and accessing the majority of codes through the Mercedes proprietary system is the Carsoft V12 system. This is a Mercedes single model diagnostic tool made in Belgium. Its kit consists of a 7.2 interface module, selection of leads (for all MB models) Operating USB security dongle and Carsoft V12 PC software. I will cover the use of this diagnostic equipment in another post shortly. The AC control unit in the R129 Mercedes SL model along with a few other MB models of the time (outlined in the CS1000 manual) could be accessed to diagnose system problems by retrieving fault codes directly from the AC control unit console in the car. Instead of counting flashes, the AC console displayed fault codes on the two digit LCD temperature display and were cleared by a combination of pushing buttons. 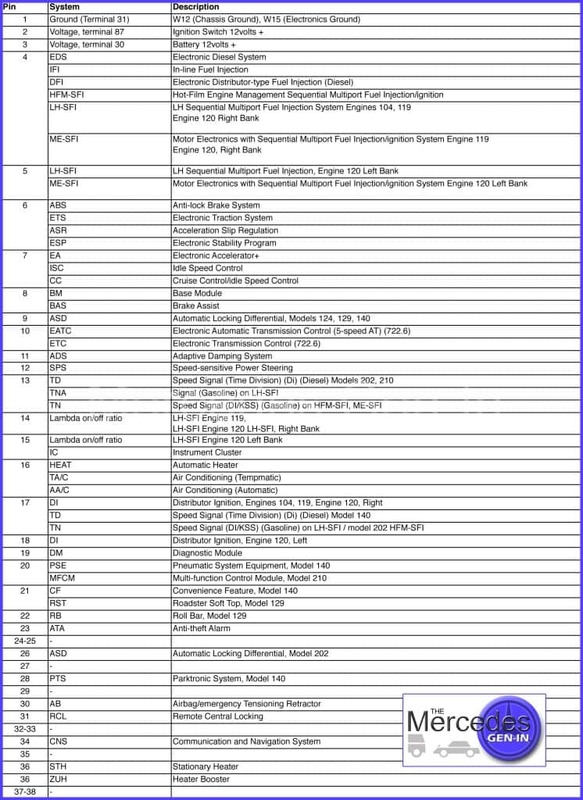 Information for the reading and clearing of the diagnostic codes of the AC unit for the R129 can be found on page 90 of the Cs1000 Baum Tools Manual. Information on other period MB models that had similar AC control consoles is included in the above publication. Carsoft V12 connected via the 38 pin port to a 1996 SL 320 ( R129 ) . On total diagnosis it only responds with 4 results, the rest failed to communicate, having selected the 38 pin digital. It look like this software is extremely limited in scanning this particular car. Like all computer software it is a temperamental interface and you have to get things just right. It is most certainly not limited (but I suppose is to the MB tools) but is probably one of the best available tools for older diagnostics. You will have to play with the settings a little to get the most out of it (the settings for the port comms are critical) and indeed you have to run it a couple of times on occasion to connect correctly. Did you get their interface or use a clone. The only system that it cannot access is that of the roof controller which can be code red/reset via basic flashing LED tool. ABS, SRS and engine systems are covered. Let me know how you get on Frank. Carsoft do have a good support line if you purchased legitimate product with a serial (most do not ;)) and will always refund you if not satisfied. Apart from Star Diagnostics tool there is little to choose from to read vehicles from around this era. when i connect blinker code reader to pin 8 (which is for base module) the blinker reader lghts up immediately an i cannot get it to clear nor read any codes. i am having issues with very intermitent tach needle jumping. have changed throttle body, maf, coils, distributors, rotors, and plugs. i assume if vacuum leak, it would be consistent. got code 2 and 10 on pin 7, and have ordered cruise control/idle speed control module but has not arrived yet. would base module light staying lit indicate anything towards my problem? according to what i can determine, there is not an ovp relay on my 1992 400e v8. could it be that the cruise control speed control module could be faulty as dtc 2 and 10 on pin 7 indicate? See here and here, it could help locate the OVP, overprotection is provided by the base module it seems in this instance. I would pull the base module from the backplane and check it over. Power distribution to modules including the Cruise control I suspect, will all be powered through the base module. Any dry joint or intermittency here could be an issue. This would be my No. 1 look-at first. thank you for response. already purchased cc/isc module but will check base module as well. will let you know how i make out after receiving module. Hello, I have a 91 w124, with a m103 engine, I wanted to do a Duty Cycle measurement, most guides indicate use of pin 2 and 3 but i dont have a lead in my Pin 3, do you have any info on this ? I think the W124 in SA spec did not have the diagnostics pin 3 connection. You may get some further info from here there is referenced some good links in the thread. Hopefully it should point you in the right direction. i did a speed up on the highway, then suddenly ASR and ABS-lights went on. Fuel consumption went down to 0 (it goes up to 20 when I’m not driving and motor is idle). the motor runs very roughly and the temperature is going to 110 degrees C when i’m not driving. I tried to disconnect battery for 1 hour. nothing works. It could be a number of things but it sounds like you could have lost the primary speed sense signal from either the front left or rear wheel. Check with a torch and see if the reluctor ring has split become loose on rear drive shaft where it enters the hub carrier. The front sensors can be taken out and cleaned as often they collect rust and then do not detect correctly, there is a single allen bolt holding them into the front carrier assembly. Another more likely problem could be that you have lost a vacuum hose some where, this would effect the fuel economy gauge and even running of the motor. It may even prevent the headlamp lifters from working! Check out all the fine pipework around the engine looking for a split or disconnected hose, fix or repair where necessary. Strange but I would not have thought the ABS lamp would have come on with a vac fault but nothing is impossible if it is a critical system. It will communicate with both new and old MB systems either through 38 pin or standard dual row OBD. So you should be OK with that. Your vehicle will be 38 pin proprietary diagnostic protocol at this age, 2000/2001 saw a full OBD compliance with the square socket as we know it in the SL foot well. Some early US versions had an additional OBD port for connection to emissions related engine parameters, the rest of the items being handled by the 38 pin as before. Compatible modern OBD readers will not function on your model year and you would need to connect either a Star diagnostic unit or one of the Carsoft interfaces to connect reliably to it. The problem you have with the roll bar activating is likely to be the position sensor often mounted on the off side rear wishbone / to chassis. This relays chassis ’tilt’ and vehicle road position to a controller that calculates if a potential of a roll-over situation is imminent, and if so activates the bar as a safety feature. Chances are the sensor is faulty or the bracket/arm is bent or damaged. If you were to replace the sensor and correct any damage to its mounting etc, chances are it would rectify the problem you have. I have a round 14 pin connector (3 pins unused) on my 2002 Sprinter 313CDi (903) – this doesn’t seem to tally with any of the the connectors on this page? Is it possible to short out pins on this connector to get the engine light to flash the codes? If so, where would I find the jump sequence, and a cribsheet of the codes? As the Sprinter you have is OBD2 compliant the flash blink method won’t work. You will need a compatible reader and simple adapter cable from the standard elongated square OBD plug to 14 pin Sprinter connector. The adapter lead is available from Ebay and not expensive. Thanks for the feedback Steve, much appreciated. Just splashed out on a cable and a BAFX module from the US, as recommended by one of the Merc dealer sites. Hoping to trace the source of an oily intercooler and a ragged idle – instinct hints its an EGR problem as I hear they were suspect on this model. But cheaper to get the reader and have a stab at getting more detail before I go the expensive route of replacing parts til the problem stops! Thanks again. I have a 2001 311cdi sprinter (U.K. ) model . Will the icarsoft mb11 reader work with this ? I assume I need the adaptor to fit the round socket next to the ecu ? Be careful on that year as it was a transition year for OBD, depending on when the vehicle was actually made it may not read with that reader. Ask the manufacturer of the tool before buying and make yourself a route to return the tool if they say yes and it does not. ‘Carsoft V12’ software and interface should read it either way, also access ABS system codes. We have a beautiful 1993 Mercedes 300TE 4Matic wagon. I would love to find a gizmo that will directly read the codes. As the communications protocol is pre OBD you have three options, one is the the led code flasher, basic and not really what you want. 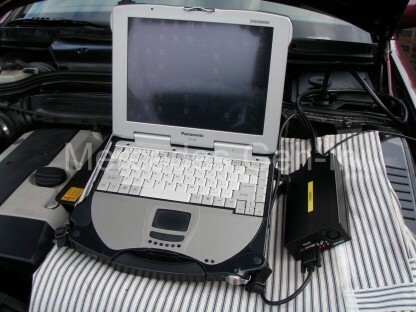 Two, Carsoft V12 for Mercedes, runs on laptop with serial port and their own special interface. Cost about £250 gbp. Or Mercedes-Benz star clone and software, cost with interface about £800. Option two is best bet, check with them in Belgium to see if your exact model is covered, but I think it is. Thank you so much. I’ll have a look and report back. How does the Carsoft V12 connect to my gasoline 1993 300TE 4Matic wagon? Thus far, I have bought the software and a computer that runs it but have found zero information on how to use it. There is no mention I can find of how to connect it to the car. They called me from Belgium and told me it works. 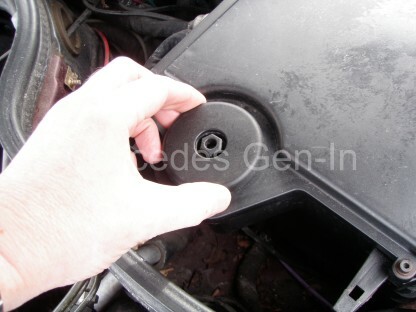 i am looking for small scaner for mercedes w202 1999. Take a look at the MaxiDiag Autel range of scanners. Hi Steve – thanks for your time sharing so much really clear and useful information. I have a 1997 SLK R170 230 with a 38 pin socket. What is my best option to read / clear all codes? The alarm is not working; remote is not working. Possibly due to water ingress in the door locking pump which has corroded the connector. Now looking to solder in a new connector. Any idea where I can buy one other than the dealer complete harness? Also have a W124 300E and it would be great to get one scanner working on both cars. Look at Carsoft V10 and Interface for the do-all diagnostic software/kit. Best bet is to get a plug cut from a loom on a scrap car, there are breaker SLK’s a plenty to choose from and very few I would imagine are completely stripped to loom level before hitting the crusher – so chances of finding one in a breakers yard is quite high. Try Ebay or search for Carsoft V12 Diagnostic Software and Interface. http://www.carsoft.com/single-brand/carsoft-mercedes-v12-software.html Carsoft are based in Hasselt in Belgium. Hi Steve, on behalf of everyone who has ever visited your pages, thank you for being so helpful. Keith, aka Cheyenne from the Sprinter forum, was kind enough to direct me to you. I’m in Australia & have a T1N Feb/03 316 ex ambo with Sprintshifter – VIN WDF9036622A903983. It has a 14 pin diagnostic plug. Without warning it simply refuses to start, identical to running out of Diesel only it hasn’t. I’m thinking crank sensor or fuel cut off, but need to buy a tool to check fault codes. From what I’ve read above it would seem mine is OBD2 compliant & all I require is a 14 pin to obd adaptor cord and a tool. Keith recommends the Autel MD802, which I’m happy to run with. I just wanted to run this by you first to make sure I’m on the right path & to reduce the opportunity for any incompatibility issues with reading the fault codes. Thanks for the thanks!! The Autel Maxidiag MD802 with 10 dollar OBD to 14 pin (Aka eBay offerings) is the way to go for best in class diagnostics. Just remember to select OBD and not 14 pin on the fist screen after you select your Sprinter model! I use one of these and to be honest its more user friendly than most, you lose out on a few things over the PC driven stuff but wins hands down on portability and practicality doing 90 percent of anything you would ever need. A couple of things to consider with your van, first replace the O ring under the black $5 plastic non return valve on the fuel filter. Then when the new tool arrives, look at live data on fuel rail pressure, you should see 270-350 Bar at crank, any less and it will not reach pressure threshold and allow the injectors to fire. Rail pressure disappearing could be a faulty O ring on the pressure regulator at the rear of the rail (cheap fix) or an injector draining off the rail causing a loss in pressure and subsequent non start. Finally do not discount loom problems, I have seen this many times. Inspect where the loom comes from under the inlet manifold and passes over the engine mount before going, upward to the firewall to the ECU. I am betting you will find a break or short in this section of loom. If it won’t start get someone to crank the engine while you abuse the loom! I bet you it will burst into life! Once its running more careful flexing will identify fairly closely the troubled section. Cut open the jacket with some scissors like the paramedics use and repair anything that looks suspect inside. Any injector of the set becoming short or disconnected will cause the complete lot not to work. I will guess that it could be the o ring on the non return valve or electrical as mentioned. If it runs well when running a faulty injector is less likely to be the cause of a drop in rail pressure as they tend to be duff all the time! Good luck and report back the fun you have with your new tool… Change an ‘O’ ring first though – I have been caught out with this one just the once… didn’t happen again as at the time it turned into a very costly fix in labour time for what was in the end a few cents worth of parts. Thank you Steve, & sorry for delayed response, I wasn’t on line yesterday. I will start with the o-ring first as you suggest, I so hope that is the cause! One thing I didn’t mention was that when the van first refused to start it turned over like it had fluid in the combustion chambers i.e., it was slow to turn over like it would if the battery was really struggling, only that couldn’t be the case as I had replaced it with a high quality unit only a month or so earlier. It wound over slowly, getting faster with each revolution, exactly as you’d expect if the headgasket had leaked coolant into the chambers. This effect I can recall happening sporadically over the past few years actually, but it always fired to life. It does consume a very small amount of coolant, say every 1,500k’s (1,000m) I need to top up the filler tank with maybe 200ml (6-7 US Fl/oz), but I’ve never been sure if that was just being expelled from the header tank to the reservoir in general service and/or extreme heat. It never runs hot even in the worst conditions and never seems to consume any extra coolant than mentioned above, so I have not been too concerned. One last thing, for the past year or so the glow plug light has remained on after starting, not sure for how long but at least a few miles of driving. I’ve mentioned these things only as it may twig a memory of earlier faults. Many thanks and I will report back on my findings once I have secured the maxidiag. Great page. I own a 1992 400se (California) with the onboard blinker reader and a 38 pin connector. My onboard blinker only lights up when pressed and doesn’t give any codes. What scanner software/interface or handheld scanner would you suggest for this model. I do already have the 38 pin to 16 pin adapter. Either use a copy Star unit and software kit, expensive. Or use the Carsoft interface and software, though you should by placing a jumper in the correct pins be able to successfully get the blink code led to work. I made up a LED tester for my 1997 C280. It is giving me 13 blinks on pin 4 (HFM/SFI.) What exactly is this code and how do I fix it? I have seen 2 different documents where one says the O2 system is too rich or too lean and another that says it is HFM/SFI. Also, the engine can idle a little rough when hot. 13 blinks on HFM/SFI peg four usually means the Lambda is at out of limit, this could mean either too high or too low (too lean or too rich) You need to check for inlet manifold leaks, spray WD40 around the joint faces with the engine running and listen for a change in engine note. This would signify a leak in the gasket leaning out the mixture out of range. Excellent site: well structured and concise info, it’s very helpful, thanks! I wonder whether you’d mind to advise – I made the impulse reader as per the diagram shown here and elsewhere, tried to read signals on my 2002 W210 OM612 diesel 38-pin diagnostics socket. Instead of getting any blinks after releasing the switch, I have the LED lit during the time of depressing the switch. As the switch is released, the LED goes off, no blinks. I tried pin 6 (ABS, etc. ), since the car keeps noting BAS malfunction, so I assume there should be an error code present in this particular circuit. The key is in ignition and position 2 during the test. Am I doing something wrong? Should the pins be inserted into the socket before I turn on the ignition? Digital Diagnostics is the section you need to look at here It explains how the interface changed from flash blink to digital interface. So the flash blink used the same 38 pin connector as the later digital only system which lead to confusion of what diagnostic system was to be utilised. To sum up your flash blink tool won’t work with the 2002 W210 – Digital only. Thats why that cable will not work with any pre ODBII vehicles. K line code reader interface with fully populated 38 pin plug or LED flash code tool is the only way forward here. I have a 1984 MB 380SL, car won’t start when turning key, but the right turn indicator flashes 30 times, pauses for two seconds. This repeats a total of 3x. Was this an early diagnostic code display? What might the car be trying to tell me? Thanks! Is there any software (app) that will let elm327 understand mercedes pre OBD” socket? I came across your site while looking for a diagnostic tool for 1995 C280 Mercedes I am slowly working to restore. I have really enjoyed reading your detailed assistance for many who have had some troubles with their respective cars. I must say Thankyou for your information reguarding the Carsoft software system you had advised for the older type of Mercedes it is truly appreciated. I have in the course of working on my C280 find it difficult to find much informaiton on that particular model (W202) and Im beginning to wonder if that is because it was a really bad Mercedes model. Anyway I Thankyou again for your great website and I will keep reading along. Hi Steve! I must say that this is the first page I have found that’s giving straight answers about the diagnostics of mb. I’m wondering if you would know about a tool for my car, it’s an v-class -99 220 cdi w638 (38 pin). Im about to get the Autel MD808 Pro but i get different answers from the seller’s about the compatibility, my primary need is to read/erase codes and get rid of the service lamp.